Seborrheic keratosis is the most common noncancerous skin growth in adults. While it can look like skin cancer, seborrheic keratosis is not thought to be caused by sun-related exposure, in fact the cause is unclear. The condition typically presents as brown or black growths on the face, chest, shoulders, or back. 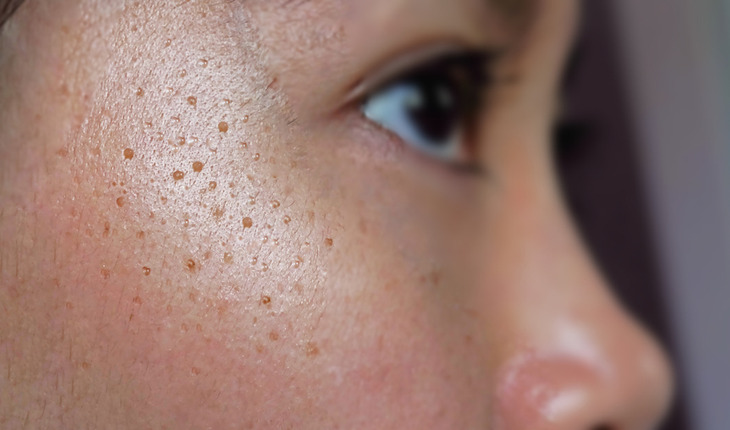 Currently, the most commonly employed treatment of seborrheic keratosis is cryosurgery, the local application of intense cold to destroy unwanted tissue. The procedure has a number of post-operative side effects ranging from scarring and blistering to pigment change most notable in dark skin types. To better understand the biological consequences of cryosurgery on pigment cells in the skin and the potential for new approaches that can potentially overcome these limitations, a team of researchers at the George Washington University (GW) School of Medicine and Health Sciences compared the toxicological impact of cryosurgery with an FDA-approved topical 40 percent hydrogen peroxide solution (A-101) for the treatment of seborrheic keratosis, in human skin equivalents derived from darker skin types. The findings were published in 2018 the Journal of the American Academy of Dermatology. In order to predict the toxicological impacts of cryosurgery and the A-101 treatment, the team evaluated skin architecture, metabolic activity, and cytotoxicity, with emphasis on melanocytes. The results of the study show that cryosurgery is a more cytotoxic treatment than A-101 for seborrheic keratosis, which suggests that A-101 could be a safer option for removal of seborrheic keratosis that reduces the risk of post-operative pigment chan. “There is ongoing clinical work evaluating the safety of this solution in darker skin types,” said Friedman. “Another important take away from this study is to also recognize how damaging even a small amount of cryotherapy, a five-second free time, can be to human skin. These findings should be considered when using for the broad array of skin diseases for which cryosurgery is warranted.